Companies often spend more time creating, updating, and validating prospect databases than actually on the phones making sales, let alone setting aside time for pre-qualifying, and hence sales figures can suffer. Doesyour field salesteam still makecold calls from outdated lists? Make their time more productive –give them better-qualified leads using our Inside Sales Services. aMarketForce’sInside Sales Services can serve as the back-office support to anysales/marketing department by scrubbing existing databases, creating new databases and business lead lists based on specific targeted companies, and generating high-quality sales leads. The Customer Database Validation and Database Scrubbing and Cleansing services can scrub a clients’ existing databases to replace incorrect contacts, update contact information, validate targets, and ensure a uniform format, thus making it a current, correct, and valuable sales asset. The Prospect Database Development service will ensure that clients get a custom ready-to-use lead list of pre-qualified, validated prospects to provide to their sales forces. Lead Nurturing and Scoring programs help clients in nurturing and warming the good-but-not-yet-ready-for-sales leads. aMarketForce’s Lead Nurturing services are designed towards creating a viable mechanism for an uninterrupted channel of communication with your warm prospects and ensuring that no warm lead goes dud or unattended. Lead nurturing and scoring program can also be automated through marketing automation software. 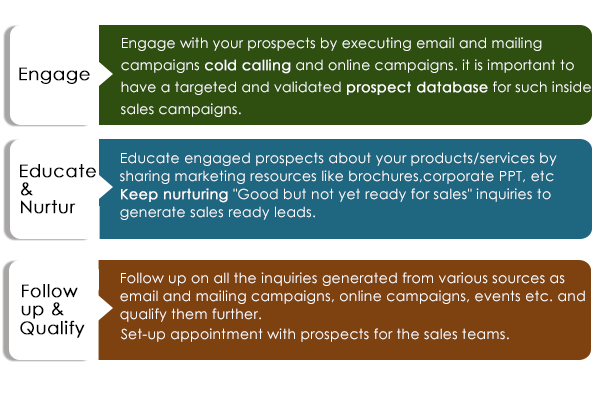 The B-to-B Lead Generation service can ensure clients have a consistent and reliable resource for B2B lead generation. aMarketForce’s highly-motivated marketing and sales team works as an extension of our clients’ internal sales force by placing calls to verified contacts and pitching the clients’ products and/or services. aMarketForce’s team performs a variety of telephone, email and, research-intensive tasks for prospect identification and qualification.